Freelancers, small business owners, contractors, and salespeople working on commission all have one thing in common: irregular income. Anyone who has worked in these professions knows the insecure feeling you get when you are lurching from flush months to lean months as work (and on-time payment) waxes and wanes. Here's how to create a budget if your income is inconsistent or irregular. Before you even get started, you should know what budgeting success will look like. According to Roger Whitney, certified financial planner and podcaster, "the goal for inconsistent income is to slowly build up your savings to the point where you can pay yourself a regular monthly salary out of your cash reserves." How do you do this? By using a method called the cash flow bucket system. With this system, instead of having your paychecks deposited into your checking account, they will go into savings. Once a month, you'll transfer the amount you need for expenses and bills into your checking account. This is your own self-created "monthly paycheck." This system is a great fit for anyone with irregular income, because it keeps excess money from burning a hole in your checking account, and will help you smooth over the irregularities in your income. However, creating a cash flow bucket system can take a little more time with inconsistent income. Here are the steps you need to follow to get this system to work for you. Before you plunge headlong into depositing all of your income into your savings account, start by putting away excess cash during high-income months. This can take some discipline. Anyone who has received irregular income knows the feeling of being flush when several paychecks or client payments come in all at once. It's very tempting to use that excess income for discretionary spending, especially if you can thank your own hustle for the huge payday. But before you blow the big check on a steak dinner, slow down and remember how tough it is to go grocery shopping with the change you pilfered out of the couch cushions. That's why it's so important to recognize when you are experiencing a flush month and immediately put aside as much of the excess income as you can. The larger your savings account is as you start the cash flow bucket system, the easier it will be for you to smooth over the inconsistency of your income. The next step is determining your baseline expenses for a regular month. This baseline should be comprised of the expenses that are the absolute essentials for maintaining your life — such as your rent or mortgage, utility bills, transportation, groceries, and child care. This figure should be relatively easy to calculate. Write down your fixed expenses, such as your rent or mortgage, and estimate the fluctuating expenses, such as utility bills and groceries, by figuring the average cost over the past six to 12 months. When you know your baseline minimum, compare it to your existing savings account balance. Assuming you already have some money saved, you can see how many months' worth of minimum expenses you have set aside in your savings account — or how much you need to accumulate. It's a good idea to have three to six months' worth saved up, depending on the variability of your income. 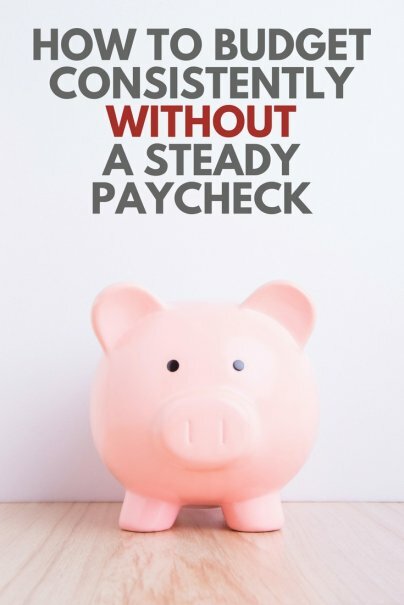 Just recognizing that you could survive with no money coming in for several months can help ease a great deal of the financial stress that comes with an inconsistent income. Once you know the bare minimum that you need to have on hand to keep the lights on and everything running, it's time to calculate how much you spend each month on discretionary purchases. This will include your spending on everything from dining out, to entertainment, to your hobbies. It's a good idea to go over several months' worth of bank statements and credit card bills to figure out how much you have spent on average on these discretionary expenses in the past. This way, you can come up with an average monthly discretionary budget. Be prepared to cut your discretionary spending as needed, since that can help you smooth over your inconsistent income more quickly. The best way to pare down discretionary spending is to cut things from easiest to hardest. If you love your weekly movie date with your best friend, then make sure that $15 you spend per week is preserved in your budget. But if you get coffee at the local coffee shop out of habit rather than enjoyment, then be prepared to start brewing your own. Now that you've beefed up your savings account during flush months, and figured out your baseline budget level and monthly discretionary spending, you can start having your payments from clients deposited directly into savings, rather than checking. Then, on the first of each month, transfer your "monthly paycheck" from your savings account into your checking account to pay for your monthly expenses. This is where things differ between someone with a steady paycheck and someone with irregular income. Depending on how much money you have already set aside in your savings account, and how frequently you deal with lean months, early on you may need to decide from month to month whether you will be living on your baseline budget or your baseline budget plus discretionary spending. However, as you build up your cash reserves, you will be able to eventually switch to an automatic transfer of your baseline budget plus discretionary spending. Your checking account will be nearly depleted by the end of the month, but if you calculated your budget correctly, the money should last you until the first of the following month. If you find you are running short before the end of the month, you will need to look at your expenses to see where your calculation went wrong or your spending was too high. You can also decide to move more money from your savings account into your checking account or end all unnecessary spending until the next month begins. The final step of budgeting irregular income is to incorporate saving for the future. While the cash flow bucket system will put excess income into your savings account and hold it for your lean months, it does not take the place of saving for retirement or other financial goals. Once you have reached a point that you have enough savings to consistently pay yourself a monthly salary, factor saving for the future into your monthly budget. Set up an automatic transfer of that amount from your savings account to your retirement fund or (other savings vehicle). Though you won't see that money in your monthly "paycheck," you will need to factor in the deduction from your savings account. Earning an irregular income can feel overwhelming. Not knowing how much you make from one month to the next may seem like a liability. But with the right money management, your irregular income can empower you to take control of your finances, your career, and your life.